it is possible to view the paintings of your choice at your own place. call or e-mail for an appointment and we’ll visit your home with the paintings you’ve chosen. this is a free service. click on ‘route’ for a map that’ll guide you to the gallery. (van tienoven) was born in zierikzee (zeeland, the netherlands). 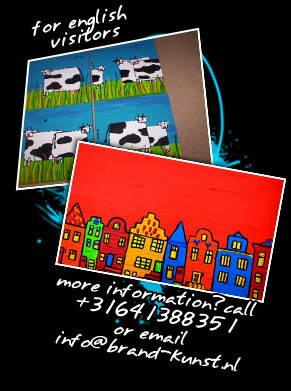 she has cheered up many areas in rotterdam and Spain with her colorful art. in her gallery in her house in rotterdam she paints almost every night from 19.00 h till 01.00 h. this is also her expo where you can find and buy her newest paintings. appointments can be scheduled during the whole day. once in a while she helps mentally and physically disabled persons with their drawings and handcrafts. for twelve years long she supported street related artists with developing their drawing skills for the ‘pauluskerk’. “ to me, a succeed painting is: powerful, tough figures, bright color compositions and bit of humor like the perfect sound of a jazz or blues song: the ultimate, warm, goosebumps feeling. often you can find pieces of fruit on my paintings, they represent sincerity, health and la dolce vita. fruit has all it’s primary colors and good shapes. painting is communication, my passion, my everything”. happy, free, peaceful and anti-kitsch is what lee-anne and her work stand for. ‘live life to the fullest’. to read more about her work, click ‘persberichten’. for expositions of her work, click ‘expositie’. because of the black lines abroad the colorful figures on the paintings it is similar to the sunlight that’s shining through glass paintings you can find in churches. the paintings are all originals, there’s only one of each. in her use of forms and colors she’s referring to the artists from the cobra-group. her recent work characterize itself by modern simplicity with dense paint, what makes it a touchable painting cause of the thick forms and lines. the painting doesn’t need a frame cause of the wide sides (4,4 cm) which lee-anne paints over, which makes the painting complete. the cheerful and uncomplicated art is accessible for a broad crowd and all age ranges, also for children. lee-anne’s paintings, with their bright colors and primitive forms, stimulate everyone’s fantasy and have a remarkably positive effect on people. both large and small spaces will get an extra boost when filled with a brand-painting. lee-anne also likes to work on bigger scales. for example: her biggest work was about 60 meters long. an entire wall filled with fantasy-animals in order from a contractor. information about this or potential appointments for your assignment such as these, you can call the artist.